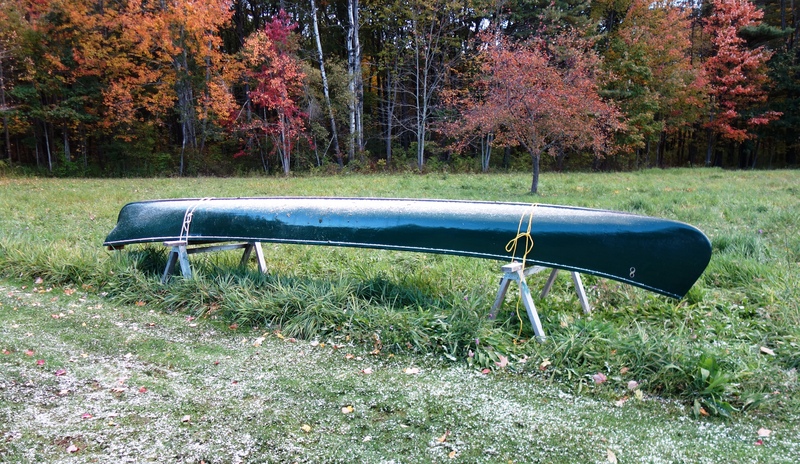 October snow on the 22′ Chestnut waiting its turn in the restoration shed. 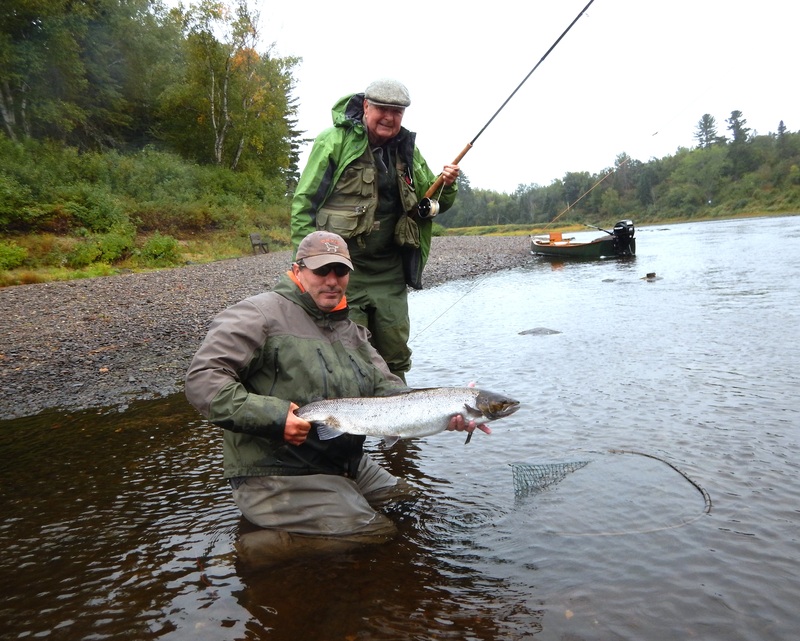 Since I’m now fully retired from the 9 to 5 world, and I spent the last 5 weeks of the Atlantic salmon season at my camp on the Miramichi. I was there long enough that coming home seemed a little strange, though being back with my wife June helped ease the withdrawal symptoms. That I was salmon fishing three days ago seems a little far-fetched when I looked out into the yard here in Maine this morning and saw a Chestnut canoe that was one of two I brought home for winter refurbishing covered with a thin layer of snow. Low water required poling to Doctor’s Island in this pram. When I got to Blackville on September 10th it was still summer, more or less. The water temps ranged from about 15C/59F in the morning, to catching a fish at a high of 22C/74F on the afternoon of September 17th. After that day, though, we didn’t have any more warm temperatures, and in fact it seemed to me the last month of the season was relatively cool. The water height was generally low. Not quite as low as 2017, but low, with the Blackville gauge reading down to .45 meters. We couldn’t run the jet canoes from Campbell’s down to Doctor’s Island, and had to drive and then wade or pole across the east channel to fish the island. Neils Jensen with a lovely cockfish from the Cains. This fish was collected as broodstock for first feeding fry stocking. Neils with another great Cains fish, this time a hen. 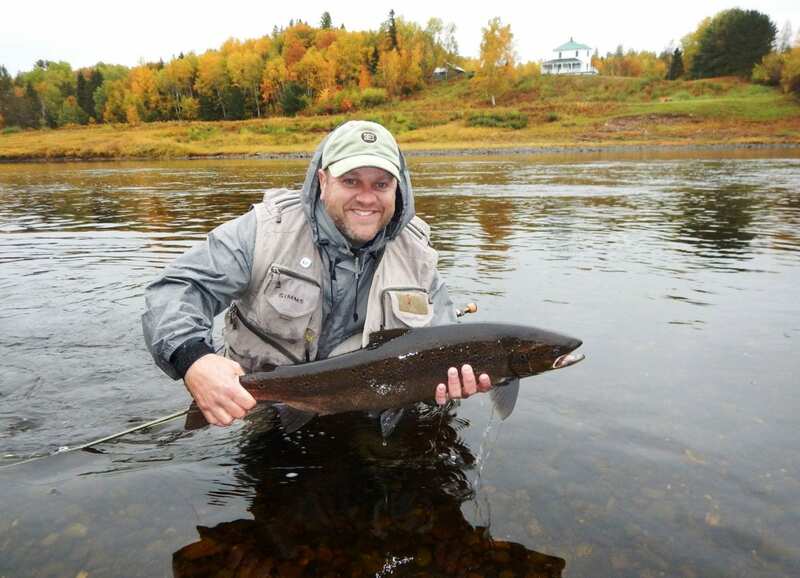 The low water really defined the fishing during almost all of September. The month ended with a moderate raise, but that wasn’t until 9/28. Fishing, though, was okay for those on the lower river who had access to a good low-water pool. There were lots of fish in some pools on the lower Cains too, but in the low flows getting them to take was very tough. It was more or less a continuation of the summer, but with cooler water. 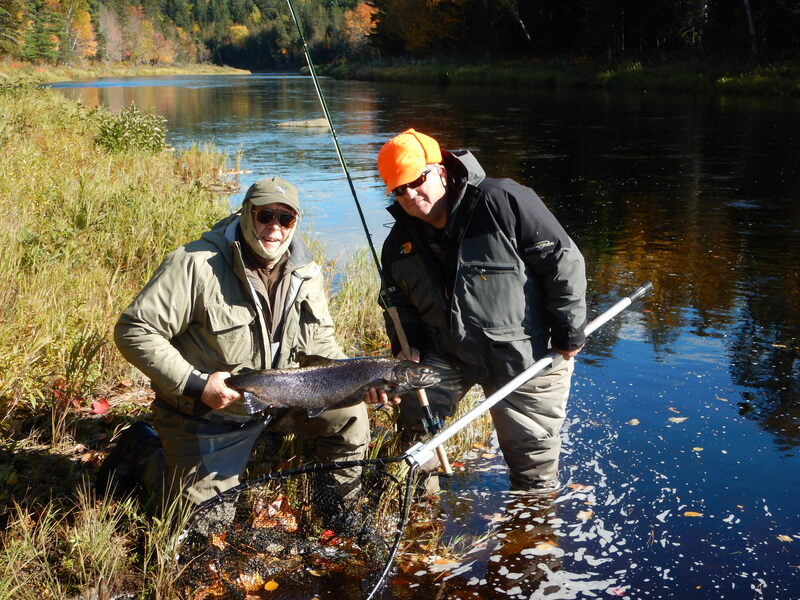 In early September many of the Miramichi lodges upriver of the mouth of the Cains really struggled to even see a fish. I spoke with Keith Wilson about their success upriver in McNamee, and he said that the last three weeks of the season were very good. Our catches during all but the last couple of days of September were on summer flies. We used things like #10 Black Bears, needle-thin Sneakies, and bombers – quite a few on bombers. Still carrying plenty of sea lice. Interestingly, and different than last fall – at least for us – we got our largest fish during the early, low water period. Jim Graul and Steve Hobson had a 20 and an 18 respectively along with some smaller fish on the 11th. During the next four weeks the largest we caught was estimated at 15 pounds. Fishing was okay by modern standards, hooking two or three salmon most days with an average of 3 anglers in camp, but there just weren’t any big days. About 55% of the fish we landed were salmon. A lot of conservation concerns are now centered around what is happening to our salmon in that first year at sea. For salmon returns to eclipse grilse returns by a very large margin – which was the case in 2018 – is essentially unprecedented in Miramichi salmon history. Salmon numbers are bolstered by repeat spawners, and it certainly appears that after the first year the salmon are much better able to cope with whatever they are struggling against in the sea. Darrell Warren holds a nice salmon from Keenan’s Pool. Fishing here was much better after the small late September raise. 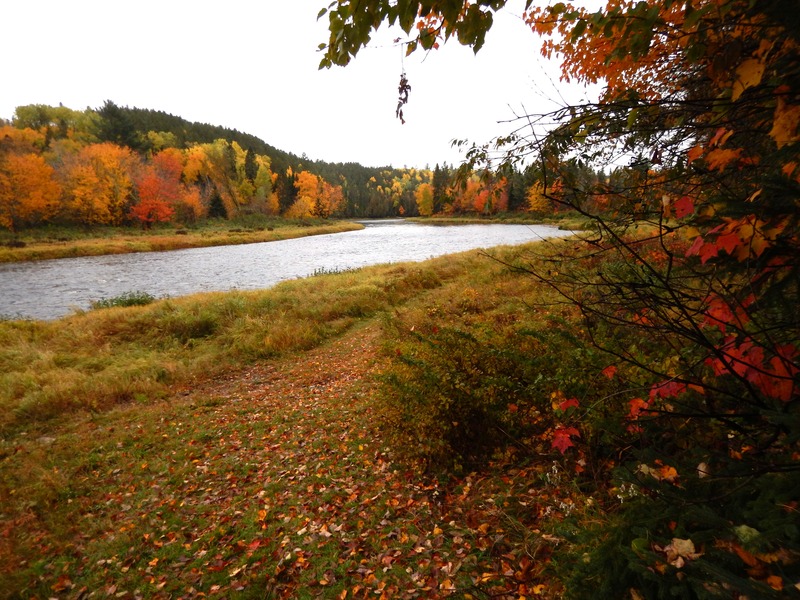 On September 27th the Miramichi got about an inch of rain in the headwaters. The Cains got very little by comparison. Correspondingly the Miramichi rose a good foot and a half while the Cains hardly budged. 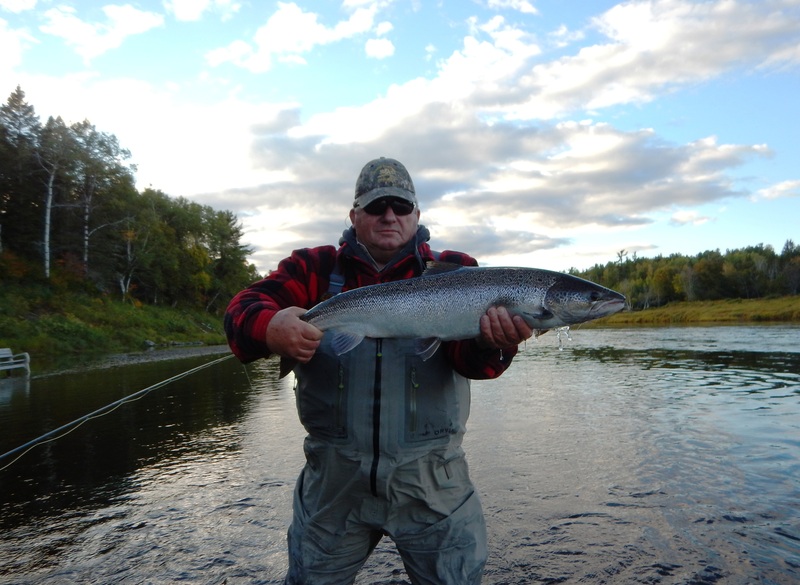 The main river fishing at Campbell’s and Keenan’s as well as Doctor’s Island was the best then that we had during September and October, and for a couple of days we averaged a fish in the net per rod each day. While this is not fantastic fishing by historic standards it was the best we had seen since the August opening of the cold water pools that hadn’t been fished for weeks – scroll back to August blog for more on that. Many of these were running fish, and therefore were not hooked as well. 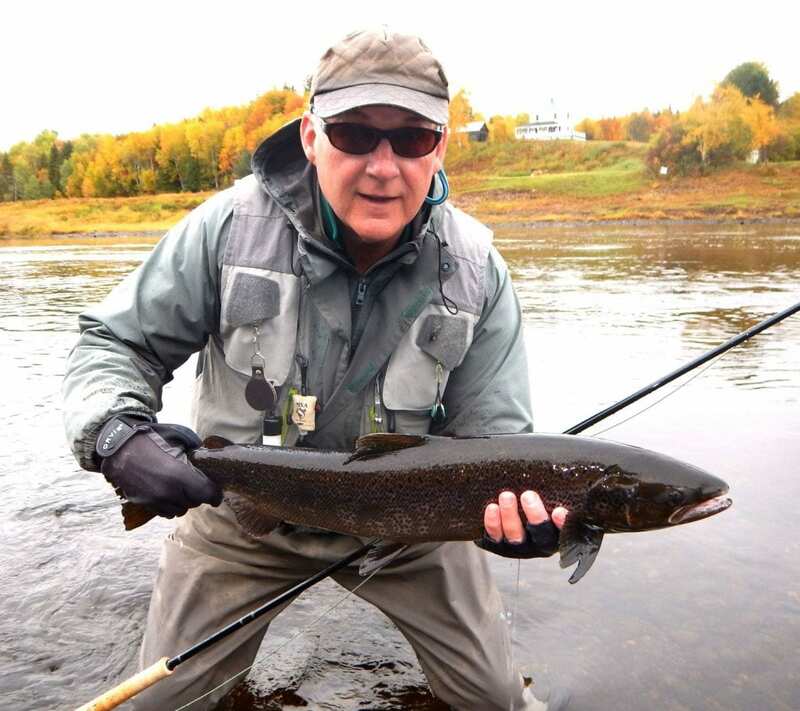 One evening at Doctor’s Island, one of my guests, an excellent and very experienced salmon fisherman, lost 5 good fish in a row that simply came unhooked early in the fight. Three days later the gauge was back under .7 meters, and fishing slowed up noticeably. Brad Burns caught this fish minutes before. Kris LeBlanc with a nice salmon from Keenan’s. When it comes to October the attention at my camp turns to the Cains. Given anything more than very low water, but less than a major raise of water, the run seems to start moving up the Cains River from the summer holding areas of Salmon Brook and below during the second half of September. The process is quite gradual. If we get a large raise of water, though, everything can change, and many of the salmon seem to go from the lower river right up into the headwaters in one big surge. It did seem that although we caught a salmon at Brophy Pool on 10/2, the numbers of fish in residence were many less than just a week earlier. In spite of this exodus reports of fish being caught further upriver were not being heard very loudly. There is a lot of river there, and the fish were taking their time moving up. 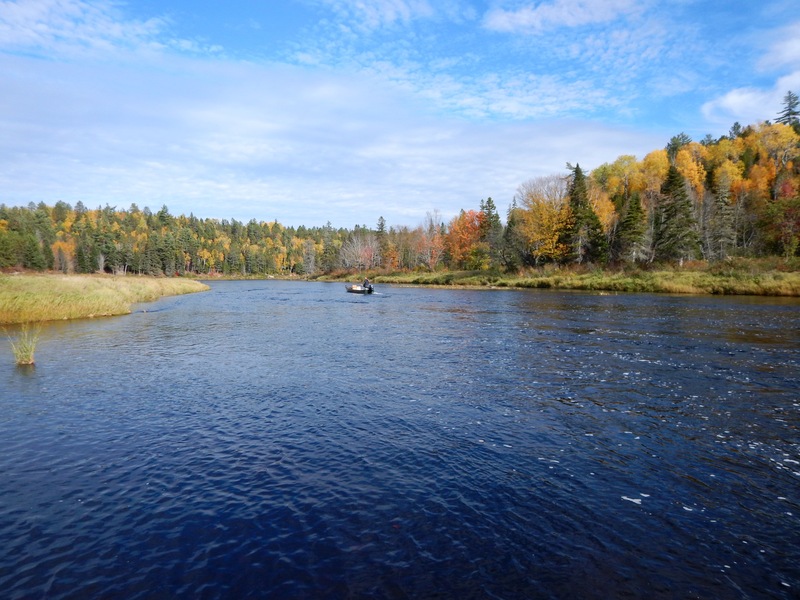 The question is always whether or not we will be able to enjoy any fishing 20 more miles upriver at Mahoney Brook. It was looking unlikely, with water as low as .52 meters as late as 10/9. Jason Curtis holds a very fresh late-season salmon caught by angler Jerry Robinson. This was a twin of another that he got that morning. Miraculously, the forecast of showers made earlier in the week morphed into significant rain, and on 10/11 the water began to rise. We got to Doctor’s Island that morning at around 7:30, and a few minutes later I saw a fish roll in the bottom of the pool. We saw perhaps a dozen fish roll or jump in various areas of the pool until about 9:30 when things became quiet again. I landed what would be our last Doctor’s Island salmon during rising water using a sink tip line and a #2 October Killer streamer fly, and a friend lost a fish on a similar rig. We also had a number of short strikes or “pulls.” This wasn’t a big catch by any measure, but these were running fish on rising water, and fish in that travel mode usually don’t take well if at all. We all got the feeling that we were looking at the tip of an iceberg. Beginning around 9:30 and running right until after 11:00 or so what must have been this same school passed through Campbell’s and Keenan’s Pools about 4 miles upriver. They saw more fish jumping than we had below, but they didn’t manage to land any of them. Tagged three days earlier at Millerton. 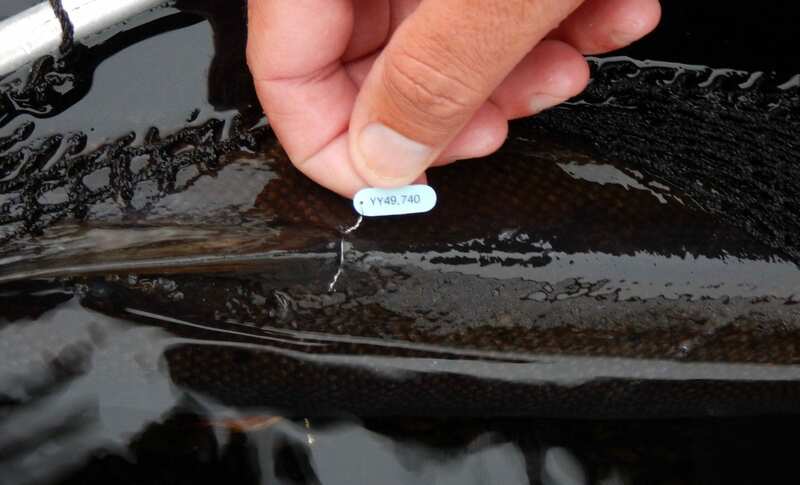 The fish that I caught was tagged, and we e-mailed DFO staff at Millerton who confirmed that the fish had been tagged there on Monday, three days before. 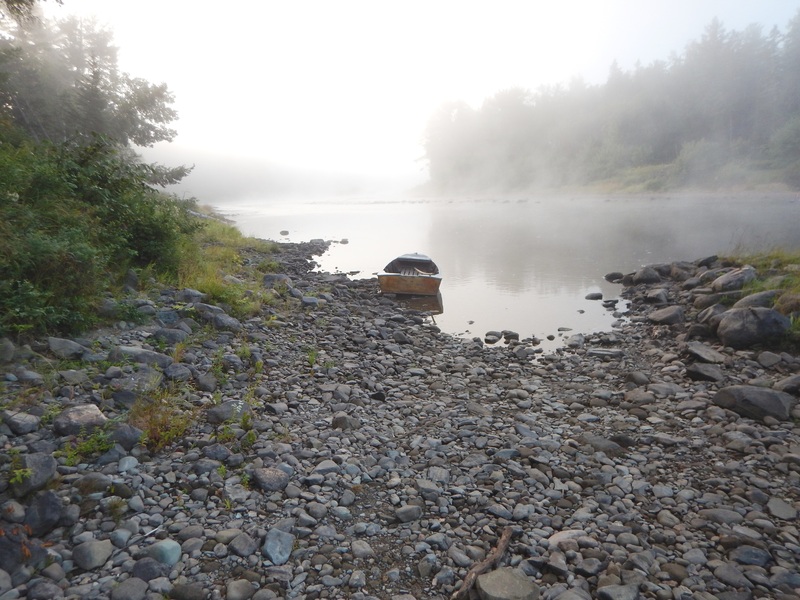 With water rapidly rising towards an eventual peak of 1.7 meters we were all highly optimistic, but we had another lesson or two to learn this year from the Miramichi. Looking upriver from the run at Mahoney Brook. I would never get to see this view enough if I lived to be 200. I was in contact with Byron Coughlan of Country Haven, and in the days just before this last raise they started to see and catch salmon in the Moore Pool just above Shinnickburn. This is about 18 miles above the mouth. Usually a day or two after we hear of them at the Moore Pool we find them in the waters around Mahoney Brook, so we started making daily trips. These trips are always a bit of an adventure. First, the camp is relatively remote, and the mornings in October are often very cold. In this country that often spells moose, and on our first morning in I saw three in one group at the top of a hill, then a big bull less than a half mile further on. 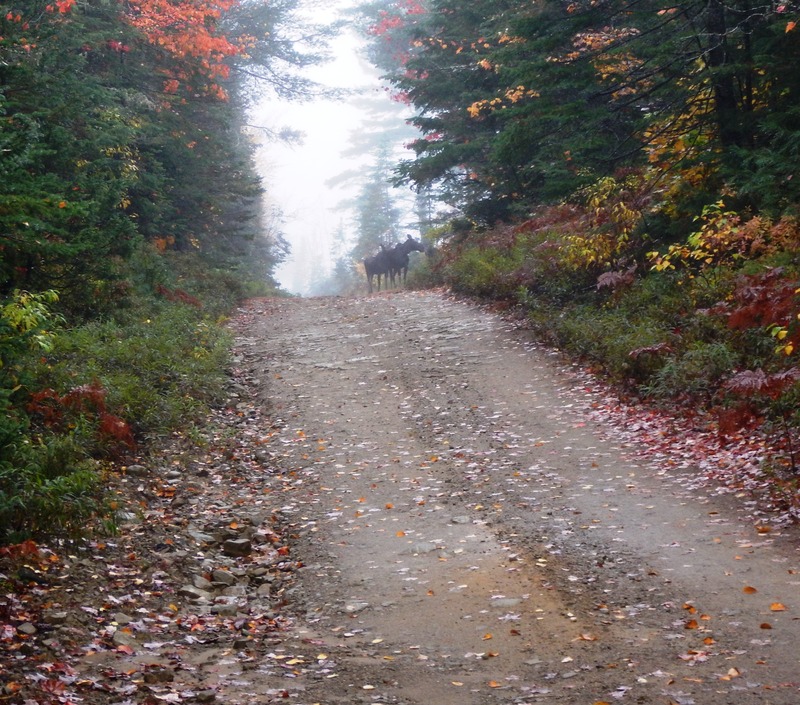 We saw moose every day we went up, and one day I was fishing the home pool at Mahoney Brook when I heard what sounded like someone hitting rocks underwater with a sledge hammer. I turned and looked up stream to see a big bull moose about 500 feet away trudging across the river. I could clearly hear his hooves hit the river bottom with every step. It had taken me about three minutes to carefully wade across that pool, and he ambled across in about 20 seconds. Three moose seen in one group on the way in to Mahoney Brook on the upper Cains River. Bill Utley fighting salmon with Darrell Warren waiting with the net at the Wood’s Pool on the Cains. On 10/12 the Cains was rising rapidly. Unlike the main river the Cains peaks fairly quickly, and drops down enough to clear up almost immediately. We fished on 10/12 but it was very dirty and still rising. On 10/13 it was still high, but fairly clear. We saw one fish jump near the camp, but we caught nothing. On 10/14 the Cains was dropping back nicely and we caught two teen-sized salmon and had some other interest in our flies. Both the fish we caught had sea lice, so they weren’t fish that had been holding in the lower Cains, they were fresh in from the estuary. On the last day we fished hard up and down river from the Mahoney Brook camp, but the only action we had was raising one fish that hit the fly but failed to become hooked. It seemed likely to me that the great many Cains River fish that had been holding between Black Brook and Sabbies River just blew right by us on that raise. Keith said that he felt a lot of fish ran up to the Cains headwaters to spawn on that big raise, but as was our experience 35 miles downriver from there it wasn’t easy to get these determined fish to stop and take a fly. He will have a much better idea when the fish start making redds on the gravel bars in another couple of weeks. Keith will fill us in on that, and I’ll be headed back up to Mahoney Brook in early November to hang out for a few days. I’ll get a report out after that regarding any spawning activity that I see or hear about. Herman’s Choice Cains River, feather-wing streamer fly. 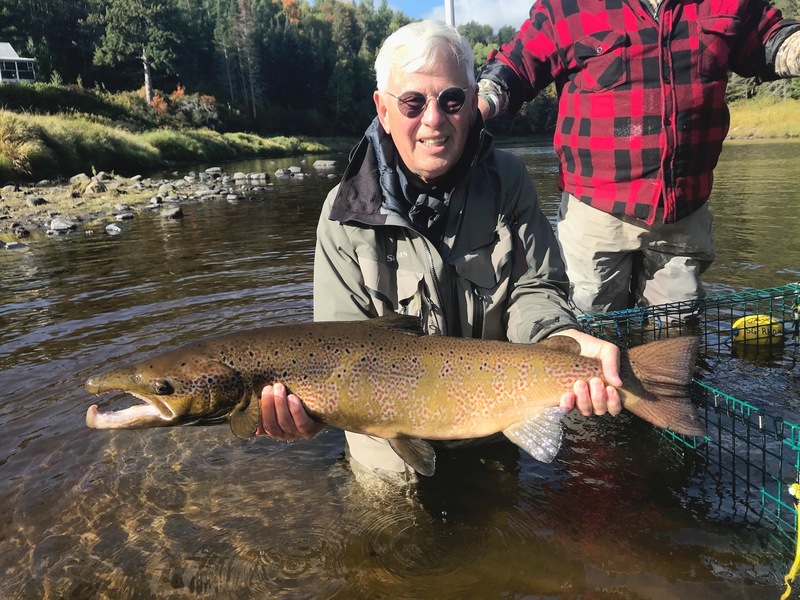 My friend Bill Utley caught one of the sea-liced, Mahoney Brook salmon, but what is more noteworthy than the catch itself is that he caught it on a Herman’s Choice Cains River streamer. Bill tied all the flies for my upcoming book On the Cains: Atlantic Salmon and Sea-Run Brook Trout on the Miramichi’s Greatest Tributary. 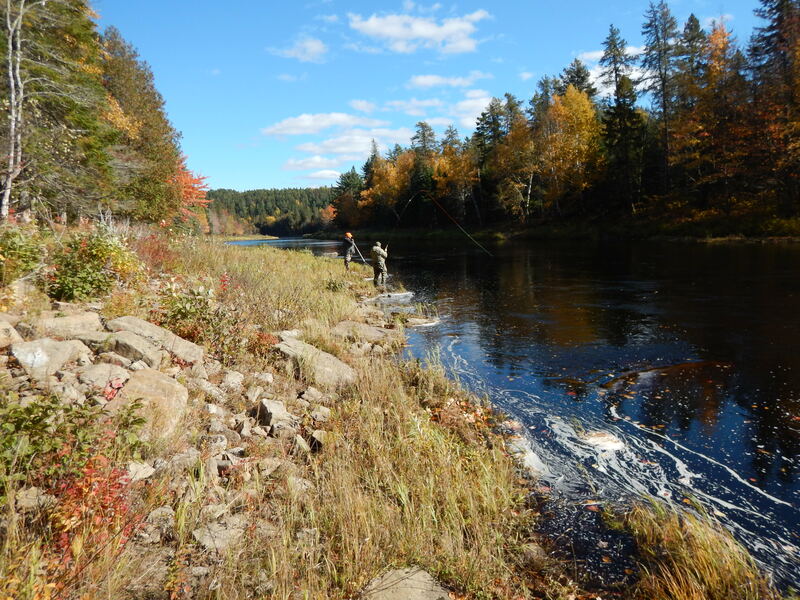 The Cains River streamers date back to the beginning of sport fishing on the Miramichi and Cains Rivers when one of outfitter Harry Allen’s sports snagged some long grass on a back cast and launched it into a pool full of reluctant salmon – or so the story is told – and then it was immediately taken by a big salmon. Harry went back to his farm and tied a few of what became known as Allen’s Streamer with some long hackles that he pulled from one of his roosters. Later Oscar Weber of the Weber Tackle Company made the series famous. Many of flies were named for Harry Allen and his guides, though I don’t know who Herman was. 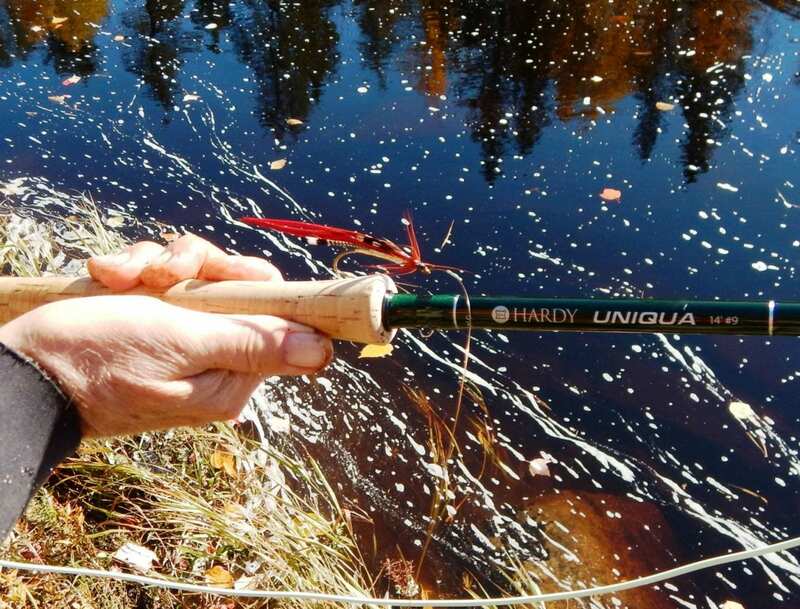 There was, for instance, a Wade’s Choice streamer named for Allen’s young guide Charlie Wade who went on to be the most famous name in Miramichi salmon fishing as the founder of Wade’s Fishing Lodge. It was great to see a nice fish taken on a 100 year old pattern designed originally for the Cains River. Cains River brook trout. The decrease in their abundance in just 5 or 6 years is astounding. What a beautiful creature. Keith did add that during the time they should be there that they were not seeing any big brook trout in the normal spawning areas. 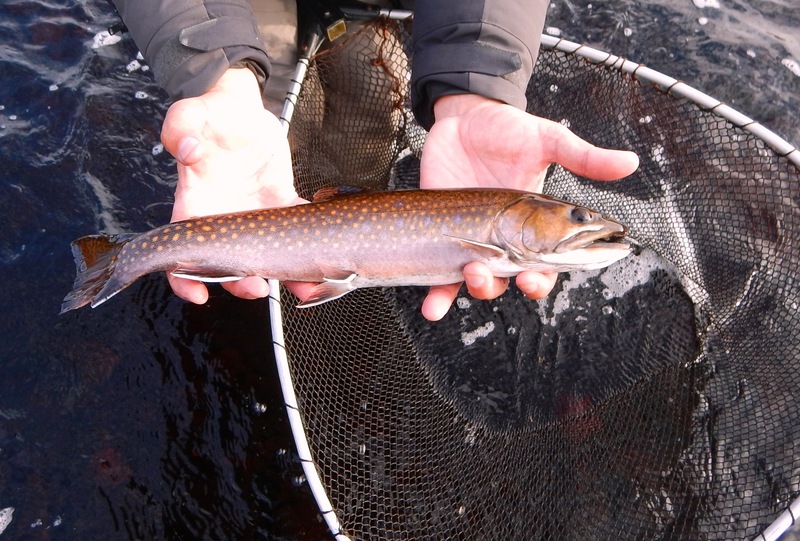 As with Atlantic salmon, smelts, and gasperaux it seems as if the brookie population has been headed in the exact opposite direction than striped bass down in the estuary. It can’t possibly be coincidental. I did get what now stands for a decent brook trout of about 16 inches along with a couple of smaller ones at Mahoney Brook during the last couple days of the season. 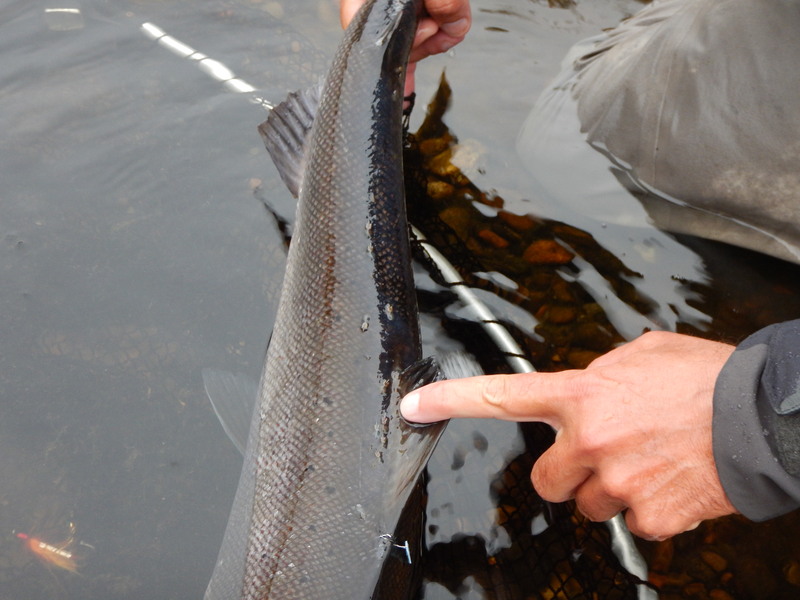 The larger fish hit so hard that I thought it was a grilse for a while. Just 6 or 7 years ago there were so many brookies in the run in front of the camp that they were almost a nuisance during the October fishing. I’ll report more on how the First Nations commercial fishery for striped bass is going later in the fall, and I will have full wrap up of the Miramichi trap numbers and estimated size of the run. I can tell you that as of 10/15 salmon numbers were up substantially over last year, but grilse numbers were way down from what was already a very low number. Head guide Jason Curtis heading down the Cains River at 3:00 PM 10/15 for the 22 mile ride to Campbell’s Pool. The season is over. 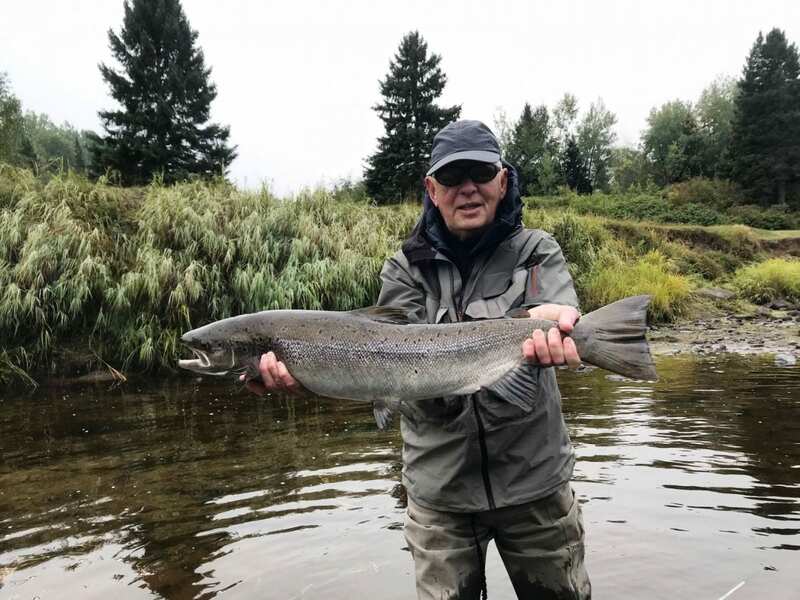 The post 2018 Miramichi and Cains Rivers Fall Fishing Recap appeared first on Brad Burns Fishing.